Without the burden of exposition, Christopher Nolan molds his Batman sequel into a compelling crime drama that probes deep into the frightening psyches of Bob Kane’s characters. No Batman movie, or comic book movie for that matter, has ever been so character-driven or intricately plotted. It’s complex, emotional, disturbing, and almost a masterpiece. I still have reservations about Christian Bale as Batman, but the rest of the cast is terrific. 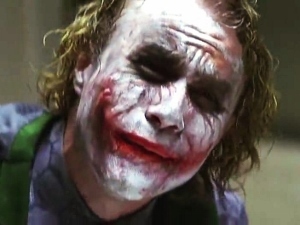 Everything you’ve heard about Heath Ledger’s Oscar-winning performance as the Joker is absolutely true. He’s manic, frightening, funny, and just plain mesmerizing. Aaron Eckhart is also great as Harvey Dent/Two-Face, whose fall from grace becomes the bittersweet heart of the movie. I also have to single out the brilliant sound design, which dares scaling down to complete silence or music only (without sound effects). Composer Hans Zimmer gives the Joker a simple but chilling sound, probably the best pairing of music and character since John Williams and Darth Vader. Three-quarters into The Dark Knight, you can taste cinematic perfection. But it doesn’t quite get there. I was a little turned off by the ferry boat sequence, where the film gets on its moral soap box. I was also hoping the finale would live up to a certain piece of foreshadowing. Alfred tells Bruce Wayne about a Burmese jewel thief, comparing the criminal to Gotham’s Joker. When Bruce asks how the thief was apprehended, Alfred says they burned the forest down to find him. The movie was delivering on so many promises at that point, I fully expected to see Gotham City in flames before the Joker was brought to justice. Aside from a destroyed hospital, that doesn’t quite happen. But even if it falls a hair shy of that promise, it’s refreshing to see a summer movie aim so high and deliver as well as it does. With Michael Caine, Morgan Freeman, and Maggie Gyllenhaal.